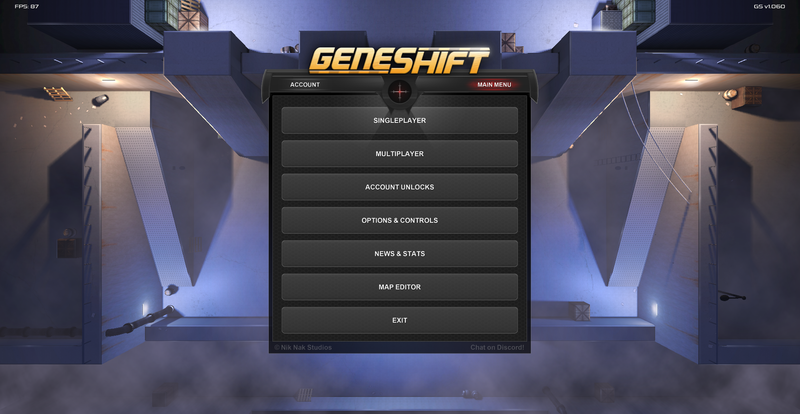 Geneshift Forums • View topic - 1.06: New Menu, Combo Kills and Barricades! Join the community in the official Geneshift Discord chat! Post subject: 1.06: New Menu, Combo Kills and Barricades! A few nice changes in this version, the biggest one being a completely reworked menu system. I should have done this earlier, because it looks great and first impressions are oh so important. We've also got some nice changes to the campaign and yet another new combo kill system. The menu has been reworked in a few ways. The overall aesthetic has been improved with a cool new blue background and new textures. The actual navigation has been changed too, with a dedicated main menu which lets you go into and out of the individual pages. This results in far fewer buttons on the screen at one time and is less overwhelming to new players. Even the options menu has been resdesigned with a new "common options" page that hides most of the advanced settings that no one cares about. I've yet again reworked the Kill Combo system, but I think I've got it perfect this time. There is no longer any confusing cash multiplier step that indirectly affects how much money you get per kill. The new system simply gives you extra cash directly. Instead of a double kill increasing you multiplier by 20% so that future kills give more cash, now a double kill just straight up gives you $150 for a kill instead of $100. Easy! In the campaign there are no longer level restrictions when you unlock skills. This means you can now unlock high level skills like Teleportation at level 1! Before you had to wait till you reached level 10 to be able to do this, so with this change these skills are FAR more useful. I'm curious to see how this affects speedruns. 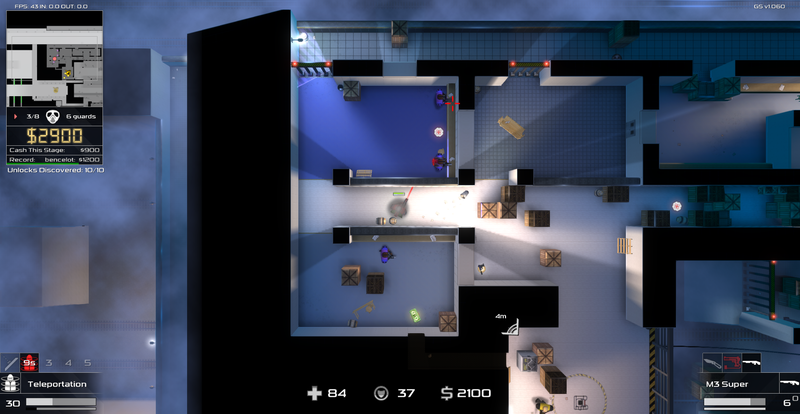 In the screenshot above you can see two barricades blocking off the top doors. This is a new feature that replaces the old doors that were hacked together with models. These are better not only because they're animated and sound cool, but because they go down into the ground when they're closed. The old models stayed the same but simply because walkable, which made it really hard to tell if you could go through them or not. The menu has been reworked, graphically and with a new naviation system. 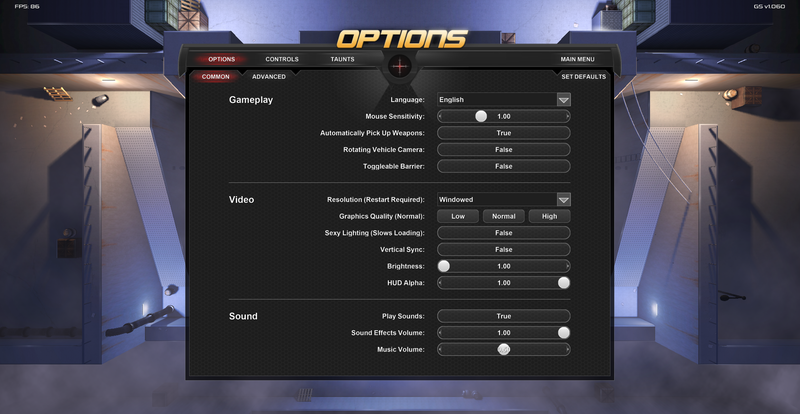 The options menu features a new "common options" section that hides away most of the advanced settings. There are now three presets in the options menu that easily adjust your graphical settings. Tweaked a bunch of text and fonts throughout the menu system. Skills can now be unlocked at any level in the campaign. Help Text is now shown as a separate popup down the bottom of the screen, instead of being spoken by guards. A new animated barricade type exists to replace some of the old doors, making it clearer if you can or cannot pass through. The Kill Combo system has been reworked, now rewarding extra cash for special and combo kills directly. On each stage players can now compete for the total cash earned in the stage, rather than compete over the highest cash multiplier (which no longer exists). The loading screen between campaign stages now has animated text to build suspense when you see your end of round stats. Made some general tweaks to Laboratory and Subway. Fixed a bug where vehicles would get stuck on the sides of walls. Fixed a performance issue on some systems. Honestly I fixed a bunch of other things, but I forgot to add them to the changelog this version. Lots of good stuff, go enjoy! Creator of Geneshift and Nik Nak Studios. Hope you enjoy the game!